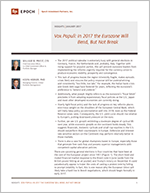 Vox Populi: In 2017 the Eurozone Will Bend, But Not Break - Epoch Investment Partners, Inc. The 2017 political calendar is extremely busy with general elections in Germany, France, the Netherlands and, probably, Italy. Together with rising support for populist parties, this will prevent eurozone leaders from implementing the reforms urgently required for the currency union to produce economic stability, prosperity and convergence. Additionally, what Joseph Stiglitz refers to as the eurozone’s “fiscal fetish” precludes it from adopting expansionary fiscal policies as the U.S., Japan and most other developed economies are currently doing. Overly tight fiscal policy and the lack of progress on key reforms places enormous weight on the shoulders of the European Central Bank, which will likely keep policy accommodative well into 2018, even as the Federal Reserve raises rates. Consequently, the U.S. yield curve should rise relative to Europe’s, putting downward pressure on the euro. Further, we see U.S. growth exhibiting a moderate degree of cyclical lift next year, while economic growth on the continent holds steady. This suggests financials, domestic cyclicals and small-cap equities in the U.S. should outperform their counterparts in Europe. Defensive and interest-rate sensitive sectors on the Continent may perform relatively better in those markets. There is also a case for global champions based in Europe, especially those that generate free cash flow and possess superior managements with competent capital allocation policies. There are upcoming general elections in four countries that have been at the core of the European project since 1951 (Figure 1). The short-lived and muted financial market response to the Brexit vote in June (aside from the British pound hitting an air pocket) and Trump’s victory on November 8 could paradoxically appear to lower the costs of casting a protest vote by failing to prompt volatility. In fact, this is one reason why the European Union will likely take a hard line in Brexit negotiations, which should begin formally in early 2017. Centrifugal forces appear to have the upper hand as populist parties gain support and many of their policies are adopted by the mainstream. This is particularly true with the upcoming elections, as establishment parties are exhibiting little political will, especially regarding much maligned institutions like the European Union and European Council. Feeling threatened by the euroskeptic populists, mainstream politicians have been reluctant to agree to the changes necessary to address the euro’s structural flaws. This makes episodic crises all but inevitable, as we have seen with Italian banks and Greek debt. Further, it means that the much needed easing of fiscal policy is unlikely to be realized. All of the populist movements challenge entrenched “elites,” focusing much of their criticism on institutions such as the EU, EC and ECB. Further, most of the anti-euro populists who are in the ascendancy are skeptical of immigration and free trade. Rather than promoting convergence, they are actively calling for member states to be given back some powers (most notably over immigration). This is particularly worrisome given that in many European countries, populist parties are polling in first or second place (Figure 2). They are setting Europe’s pace, even without winning elections. Indeed, the key lesson from their experience in power is that the attended responsibilities can be poisonous, leading to plummeting support. Source: National surveys. AfD was founded in 2/2013, while Podemos was founded in 3/2014. The European Union is viewed, on net, unfavorably in many countries, including France, Spain, the UK and Greece. Pew Research shows that favorable views of the EU have declined dramatically over the last decade, primarily because of the region’s dismal economic performance. Similarly, trust in the ECB has fallen markedly. This is particularly worrisome given that the ECB is the region’s only truly federal economic institution and that Germany’s perspective is particularly negative (Figure 3). Large majorities in France, Italy, Spain, Belgium and Germany (among others) believe their country is on the “wrong track” (Figure 4). This is largely because of the region’s poor economic performance, which is partially due to the lack of cyclical shock absorbers. The creation of the single currency took away from individual countries critical adjustment mechanisms (currency depreciation, interest rate cuts, fiscal policy) and did not put anything in their place. Additionally, crises rarely make for smart policy and Europe has known little but crisis for years. Moreover, in a financial crisis it is the creditors who rule and German economic ideology has overemphasized austerity, which has led to severe economic contractions for many countries. Rather than convergence and bringing Europeans together, the euro has caused economic divergence, division and disarray, and in some cases like Greece and Italy, despair. This has proven counterproductive, as to many the European project is now identified with mass unemployment and economic crises. Designed to bring Europe together and promote prosperity, in the eyes of many citizens the euro has done quite the opposite. Further, recent Eurobarometer surveys show that immigration and terrorism have become top concerns. This has provided a tailwind for populist movements and added pushback against the four freedoms of the single market (especially for the free movement of labor). The underlying cause of the ascendancy of populists parties and the declining support for European institutions is weak growth. To illustrate, industrial production is well below its 1999 level in many European countries, with Germany the notable exception (Figure 5). A similar result occurs if we focus instead on GDP, with Italy again the biggest loser. In fact, Italy’s economy has barely grown since the common currency was introduced. Further, across the eurozone growth remains very weak relative to the pre-GFC trend, with the continent faring significantly worse than the U.S. Similarly, we see the great divergence if we focus on productivity growth, again with Italy constituting the notable laggard (Figure 6). By contrast, countries like Germany have posted productivity growth in the 0.5 to 1.0% range, reflecting their success in keeping unit labor costs under control (partially due to the 2002 Hartz reforms under Chancellor Schröder). What is particularly troubling is that pre-1999, Italy kept pace with the faster growing countries. Italian productivity grew, on average, by 3.2% from 1960 to 1999, but since then has averaged a dismal -0.25%. This is terrible relative to both its own history as well as to the eurozone average (a tepid 0.65% since 1999). Further, with flat or shrinking labor forces, this implies trend growth of roughly 0% for Italy and around 1.0% for Europe as a whole. One manifestation of this divergence is Germany’s huge current account surplus. Assisted by a relatively cheap euro and historically low interest rates, Germany’s current account surplus has soared to 8.8% of GDP, dwarfing China’s 2.4% and Japan’s 3.7%. While Germany’s export machine has reaped great advantage from the weak euro, the same cannot be said of Italy or Spain (since 1999 their current account deficit as a % of GDP has averaged 0.6% and 3.4%, respectively). Even France has averaged a current account deficit of 0.9% of GDP over the last decade. Domestic demand growth remains weak and we don’t expect the eurozone output gap to close until late-2019 or early-2020 (similarly, we don’t see the unemployment rate falling to NAIRU until early-2019). As a result, we expect core CPI to remain well below the ECB’s 2.0% target for several more years (Figure 8). Additionally, the Eurozone’s inadequate institutional framework (including overly constrained fiscal levers) puts far too much of the counter-cyclical policy burden on the shoulders of the ECB. This has caused the ECB to implement the most accommodative monetary policy experienced by any post-WWII developed economy. It also means the ECB will act extremely gradually when it finally sets out to normalize policy. HOW WORRIED ARE MARKETS ABOUT ITALY? In spite of all the issues discussed above, spreads remain well behaved. More specifically, government bond yields and CDS rates relative to Germany have widened moderately, but by much less than they did in 2011 and 2012 (that is, before Draghi’s “whatever it takes” speech and the implementation of firewalls to prevent contagion). However, one place that does suggest some worry is Target 2 imbalances, which show a strong preference for Germany in cross-border payments through the Eurosystem (Figure 9). Hans-Wesner Sinn emphasizes that the Bundesbank would lose heavily in the event of an exit by Italy or Spain, while Carmen Reinhart argues that this is a sign of capital flight from Italy, reflecting the ongoing balance of payments crisis. FIGURE 9: ARE TARGET 2 IMBALANCES A SIGN OF CAPITAL FLIGHT AND A RISK TO THE BUNDESBANK? A second place where the stress in Italy shows up is in the dramatic underperformance of the equity market and particularly the banking sector (Figure 10). Italian equities have underperformed European equities by 40% since early 2010, although recent price behavior points to a bottom. Similarly, the Italian financial sector has underperformed Europe’s by a staggering 55% although, again, the worst may be behind us. One reason this is important is that both credit creation and economic growth require a well-capitalized banking system and this is something that Italy desperately needs. Further, the populist Five Star Movement is polling very well and an Italian election is likely in mid-2017. The evidence over recent years strongly suggests that when political risk rises, as would certainly occur with a M5S victory, Italian equities underperform Europe, with financials especially hard hit. MXIT: MSCI Italy, MXEU: MSCI Europe, MXITOFN: Financials sector of MSCI Italy, MXEU0FI: Financials sector of MSCI Europe. WHAT DOES ALL THIS MEAN FOR INVESTORS? For a start, the ECB is likely to keep policy accommodative well into 2018, even as the Fed hikes. Consequently, the U.S. yield curve should rise relative to Europe’s, placing downward pressure on the euro. Further, we see U.S. growth exhibiting a moderate degree of cyclical lift next year, while economic growth on the continent holds steady. Together, these views suggest that financials, domestic cyclicals and small-cap stocks in the U.S. should outperform their counterparts in Europe. Defensive and interest-rate sensitive sectors on the Continent may perform relatively better in these markets. Additionally, there is a strong case for global champions based in Europe, especially those that generate free cash flow and possess superior managements with competent capital allocation policies. M. Brunnermeir, H. James & J. Landau, “The euro and the battle of ideas,” Princeton University, 2016. J. Feliu, “Trump, NATO and European defense spending,” Bruegel, Nov 15, 2016. D. Marsh, “The Euro: The battle for the new global currency,” Yale University Press, 2011. C. Reinhart, “Fleeing from Italy,” Project Syndicate, Nov 23, 2016. H-W Sinn, “Europe’s Secret Bailout,” Project Syndicate, Nov 28, 2016. J. Stiglitz, “The Euro: How a Common Currency threatens the future of Europe,” 2016. M. Wolfe, “The shifts and the shocks”, 2014. Y. Varoufakis, “Greece’s Perpetual Crisis”, Project Syndicate, Dec 20, 2016.